The Galley Gourmet: Sunday Dinner and Happy New Year! Even though there is still no snow on the ground, the weather is a bit chilly and perfect for a hot cup of cocoa. I could think of no better way to end our New Year's Day Sunday dinner and start 2012 than with this cake. 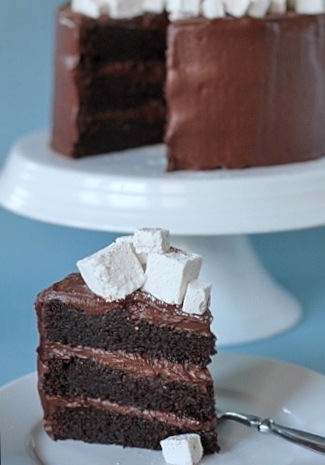 Although the name of the cake implies that there is hot cocoa flavor, this cake is more an excellent excuse to eat a fantastic piece of chocolate cake with homemade marshmallows on top. This is a pretty intense chocolate cake. The cake is very moist and flavorful and the frosting is right at the top of the "best chocolate frosting ever" list (at least that is what my husband claims). The cake itself is rather straightforward and simple, and is made in a bowl and mixed by hand. The frosting, however, utilizes a different method which I take one step further by straining it through a fine-mesh sieve to ensure a completely smooth consistency. It is cooked on the stove top and cooled in a 9x13-inch baking pan before being whipped until fluffy and smooth. I changed up the recipe slightly by adding a bit of espresso powder to the cake batter and frosting and by using semisweet instead of bittersweet chocolate. The recipe also calls for a few not so common ingredients, like vanilla bean and Lyle's Golden Syrup, but they can easily be found in most grocery stores. Cake, frosting, and marshmallows may seem like a lot of work, but each step can be made in advance. The cake can be made and stored at room temperature for up to one day or frozen for up to one month. The frosting can be made and refrigerated for up to three days and the marshmallows (you only need half of a batch, so save the rest for s'mores:) can be made one month in advance. 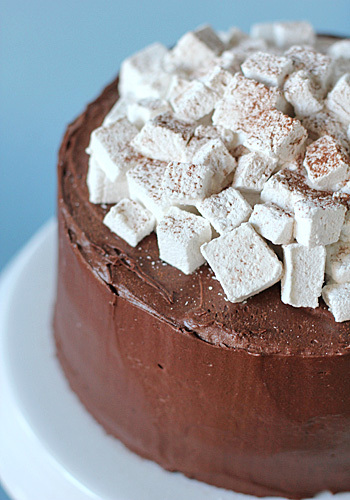 So, on the day the cake is to be served, all you need to do is frost and mound with marshmallows and indulge. Speaking of indulgence, since this is a "hot chocolate" cake, I go over the top and serve this cake with a dollop of whipped cream on the side. I know-- completely unnecessary, but trust me, it really provides a nice counter to the richness of the cake. Any leftovers are enjoyed the next day with a tall glass of cold milk. Whether you start preparation one month in advance or the day before, whatever you do, don't wait, don't bookmark, please make it soon and get your New Year off to a "sweet" start! Preheat the oven to 350º F. Line three 9-inch round cake pans with parchment paper and lightly spray with non-stick baking spray. In a 3-quart saucepan, combine the butter, oil, chopped chocolate, and water over medium heat until melted. Whisk in the espresso powder. In a large bowl, whisk together the flour, sugar, and cocoa powder. Pour the hot chocolate mixture into the sugar mixture and whisk until combined. Whisk in the eggs, one at a time, then whisk in the buttermilk, vanilla, baking soda, and salt. Evenly divide the batter between the prepared pans. Bake until a toothpick inserted in the center comes out clean, about 35-40 minutes. Cool on the rack for 10 minutes, then invert onto the racks, remove parchment and cool completely. (Cakes can be made one day ahead wrapped in plastic wrap at room temperature, or freeze for up to one month). Remove the frosting from the refrigerator or freezer and transfer to the bowl of a stand mixer fitted with the paddle attachment. Beat on medium speed for 2 minutes to soften. Increase the speed to medium-high and beat until light and fluffy, about 3 minutes. On a flat serving platter or cake stand (edges lined with strips of waxed or parchment paper to keep it clean while icing), place one cake layer. Using an off-set spatula, spread 1 1/2 cups of frosting evenly to the edges. Repeat with another cake layer and another 1 1/2 cups frosting. Top with the last cake layer. Spread a thin layer (or crumb coat) of frosting over the top and sides of the cake; refrigerate until the frosting is firm enough to seal in the crumbs, about 30 minutes. Spread the remaining frosting in a smooth layer over the entire cake. Carefully remove the paper strips to make a clean bottom edge. 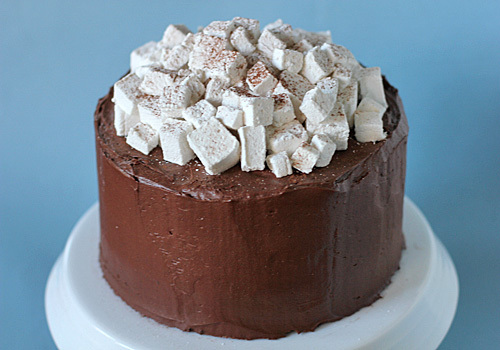 Mound the marshmallow on top of the cake and dust the top of the marshmallow with cocoa powder. Enjoy! ok that looks AMAZING!!!! i'm totally starting this tradition next year-chocolate cake on new years day!! and i LOVE freezing my cakes. saves so much time beforehand. Wow. That looks delicious. What a way to start the new year recipe list! You really know how to do New Year!!! That chocolate cake is stunning - really stunning - all the very best for 2012! Hah, too clever! I love this cake! I live in a small town and I'm not sure that I'll be able to find the Golden syrup. Is there a sub for it? Will the cake be fine without it? It looks delicious and I'm making it for my mother's birthday! Amy- Lyle's Golden Syrup has a distinct and rich taste that is made by evaporating sugar cane juice until it is thick and syrupy. Since it is a liquid sweetener, you do need it for the frosting. If you cannot find it, you can use two parts light corn syrup and 1 part molasses or equal parts honey and corn syrup. Happy baking!